Located on the southern banks of Lake Managua, in Managua, Nicaragua is the city and industrial waste-disposal site known as La Chureca. 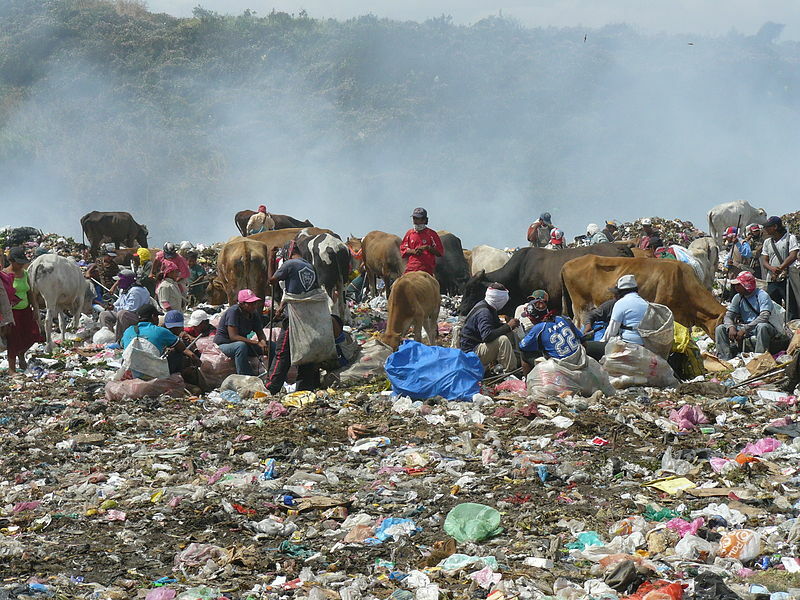 Roughly translated from Spanish slang as "city dump," it is the largest landfill in Central America. It covers an area of approximately 2.7 square miles. In normal situations, trucks would pull in to unload their garbage as awaiting bulldozers push and flatten out the trash in order to promote the process of natural decay. 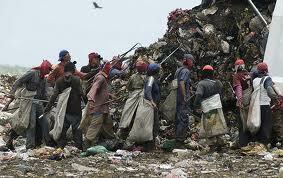 But in this case, approximately 200 families live and sift through the garbage in search of food or items to sell. To make matters worse, the most useful items such as bottles and furniture are already sold to entrepreneurs at the dump's entrance. What remains is tons of garbage with little or no value and food that is either rotten or simply too dangerous for human consumption. Scattered throughout this unhealthy zone are makeshift homes that are built from discarded cardboard and scraps of wood that only stand by leaning the pieces against one another. Its residents wear filthy, torn clothing mostly found in the dump and shoes are only worn by the lucky few. Comments by humanitarian groups are similar about the conditions that state, "It is an enormous breeding ground for flies, microbes, rotting food, burnt trash, and thousands of plastic bags." Twice a week, there is usually a thick cloud of smoke that covers the area as some areas of the dump are burned. This only increases the incredible heat and stench of glue, lead, and excrement. Another disturbing fact is that out of the roughly 200 families that live there, 50 percent are children under the age of 18. For these children, life is brutal. 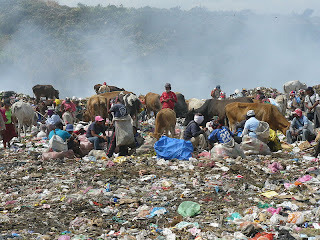 There are many reports of physical abuse by other children fighting for prized scraps of rotting meat as well as young girls prostituting themselves for "first pick" from the incoming garbage truck drivers for as low as C$2. Fortunately, news coverage about La Chureca has helped to create some level of change at the site and several major humanitarian groups have taken notice. One of these groups is the Quaker organization known as ProNica. With offices in Florida as well as Managua, they lead and organize volunteers for programs that can help the young people of La Chureca. One program in particular is Los Quinchos. Located in a walled compound with a small building and covered porch, the dedicated volunteers of Los Quinchos offer a temporary oasis from the madness just outside. The personnel come from many regions of the world and arrive by 10 a.m. to wash clothes, cook meals, and even teach reading and math to children who have never gone to school. For some of these children, this is the only schooling that they will receive because their families prefer that they help them sift through the dump instead. In addition, the simple meal of mostly rice and beans is usually their only one of the day. As stated by ProNica, "For these who live in huts of garbage, eat garbage, and wear garbage in La Chureca, Los Quinchos is a beacon of hope." Los Quinchos, also known as Asociación Los Quinchos, is a program that helps and guides former glue-sniffing street children toward better lives. Founded in 1991 by Zelinda Roccia, it currently serves more than 200 children in its three major projects: The Street Outreach Program, Yahoskas, and the aid at La Chureca. The Street Outreach Program is one the program’s most successful and important projects. The workers comb the streets for homeless children and encourage them to give up street life by joining a residency program that provide a good home with a host family, food, and education. 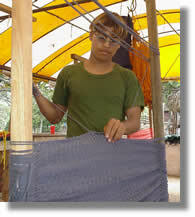 The Yahoskas program was established in 1999 as an extension of the charitable boys program. Its goal is to prevent young girls from resorting to prostitution by receiving a good home, love, and food. Currently, 25 girls ranging in age from 5 through 15 attend the program, go to public school, and also learn vocational skills such as sewing and computer applications. General requirements for all volunteers at ProNica include: the ability to speak Spanish fluently, a six-month commitment that begins in either February or September, three references, a medical evaluation and proof of international insurance. Afterwards, potential applicants are encouraged to convene a support group (known as a Quaker Clearness Committee) that can help guide the applicant for everything from preparation before the trip to the healthy transition back home. All volunteers fund their expenses during their service except for lodging, which is provided free at Casa Cuáquera, a Quaker House in Managua.